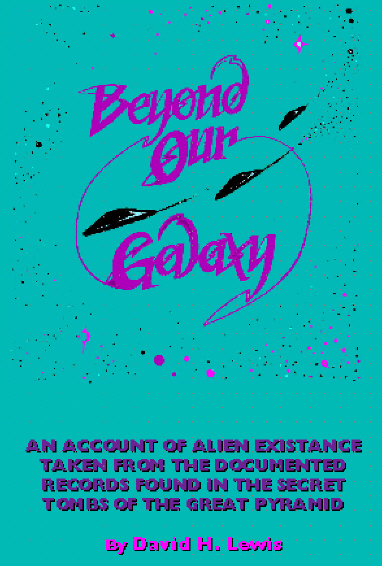 Reveals documented proof of alien existence. The author, having spent many years in intensive research involving the mysteries surrounding the Great Pyramid, was chosen to be a member of an Egyptologist Exploration that discovered the entrance and hidden passage to the secret tomb buried far below the Pyramid's base. This tomb, built many thousands of years before the construction of the Pyramid, revealed itself as an historical hall of records covering all Earthly civilizations dating back 576,000 years. Among the many microfilm clips taken in this buried tomb of ancient scrolls and recordings on metal discs, there was the undisputed record that alien life does exist on six planets... beyond our galaxy. 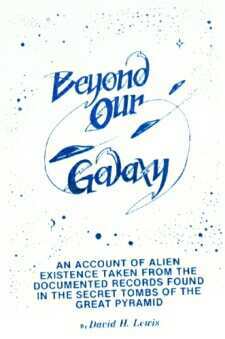 This book now reveals the documented detail of the origin of our alien visitors, along with accurate descriptions, detailed drawings of their space craft and power source, home bases, planets, life-style, the purpose of their visits to Earth and their warnings... and their eventual return. In the unlimited vastness of space, there are no known boundaries where galaxies have a definite beginning and a definite ending. There are no clocks to mark the minutes and hours. There are no calendars to delineate the days, months and years. There are no sunrises or sunsets to indicate the passing of a 24-hour period. And there, beyond our Earth, there is no longer the imprisonment of the gravitational pull that limits our destiny to global atmosphere, or rotational travel. In this great expanse of our boundless universe, there are many sun stars and millions of moons, planets two and three times the size of Earth that appear to be a mere speck in the inky darkness that always lies just ahead. There are stars leaving our Milky Way and there are immense clouds of gas falling and forming into the Milky Way. In space there are turbulent plasmas with x- and gamma rays with mighty stellar explosions at a constant rate. Our universe is vast, limitless, incomprehensible and awesome. As you travel into the realm of space, no longer do you see the tiny dotted specks of light that have been viewed for thousands of years, for as you travel further into the unknown, these tiny specks of light suddenly some into focus as asteroids, additional clusters of Milky Ways and planets resembling Saturn, Jupiter, Venus and Mars. Looking back, Earth begins to show itself as a tiny speck of light -- another star in the heavens. During this exploration through space, any fear you may have is calmed by the overwhelmingly breathtaking view of the billions of creations now surrounding you --and the creeping sensation that you are not alone. To give you some remote idea of the vastness of our universe and the distances one must travel from any given place to another, the figures are almost incomputable, for we are no longer tabulating in the millions, trillions, octrillions, gigas or gogols. There is no word in our present vocabulary that would define the great distance in mere miles. As one simple example, it takes light, traveling at 186,410.99 miles per second, a total of 30,000 years to reach Earth from the great Milky Way. To go one step further in this regard the speed of space travel is as limitless as is the vastness of the universal path of flight. I previously mentioned that alien craft were quite capable of traveling at speeds of Warp V. To give you some idea of how fast this is, consider the speed of Warp II: squaring the speed of light (which is 186,410.99 times itself, or Warp I), with that total again times itself (Warp II), it comes to the astronomical figure of slightly less than 6,363,225,107,424,952.073399 miles per second! This is equivalent to 22,907,610,386,729,827,464.23640 miles per hour. This figure no longer belongs to the calculation of billion billion, or even octrillion, but would exceed giga (which is one step beyond octrillion). These speeds are incomprehensible to us due to the fact that on Earth we are accustomed to such speeds as 120 m.p.h. or 600 m.p.h., or possibly 1200 m.p.h.! Everything on Earth is measured by time or miles; only those who have traveled to the moon and back can verify the uncanny speeds through space without the sensation of movement. Each of its original 160 pages were scanned and carefully corrected, matching the original as closely as possible. God and the Reptilian Connection?